No we've never need to have any of their breaks trimmed, I think if they have plenty of branches, cuttlefish etc to chew on it keeps them trim, although I think perhaps some folk have had to get this done, it is rare. Our Tommy has to have his claws trimmed now & then as they seem to grow quite long. I try to do them when he climbs in his cage - carefully grab a leg & clip one or two despite his protests. Although last time he has to see our vet , it took her, my hubby and their other vet to hold him & do them! 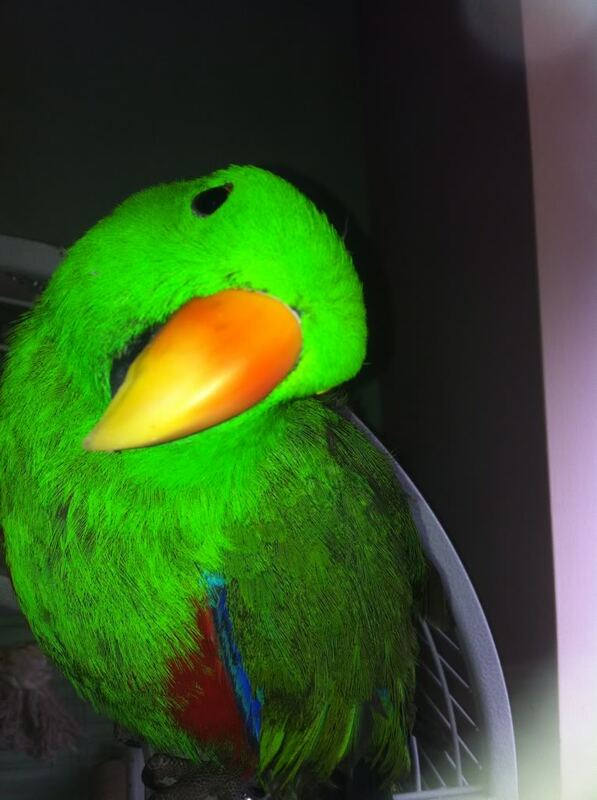 And I did find out his species I've been told the he is almost certainly a red sided ..
That's good so to give him his Latin name he's Eclectus roratus ! and a very handsome one too. 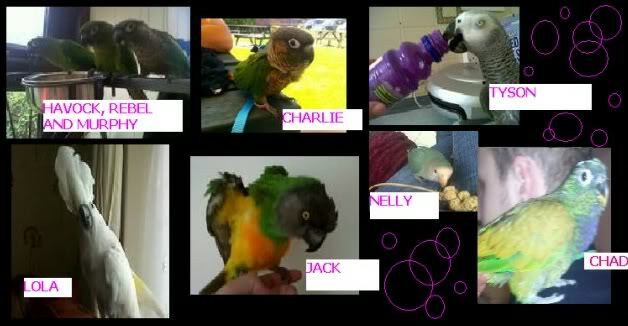 Hollie, are you going to post Charlies photo onto the Photo of the month comp? Yeah di he's been good he been having a wander around the house today I bought him a new play stand yesterday from gumtree don't thinks he likes it to much tho he don't like anything changeing in his living space ill try him again with it tomorrow. Ah, I know some don't like change I know Tommy doesn't, others do and really enjoy new things. Hi mike, I was just looking through preloved and saw you were selling Charlie? I didn't know he was up for sale? What parrot are you looking for? Aw, why is Charlie up for sale? Thought you were making progress with him? And African Greys's aren't particularly friendly Mike! I'm not selling him now I just hadn't removed my ad I wouldn't have let him go anyway is loved I promise .. It just gets frustrating sometime when he tries bite that's why I first put him on there and a member of this site invited me here and now I understand him a lot better now.. And he now removed . I'm getting on with him now really good . That's good news Mike, hope he goes from strength to strength with Charlie! Can some one add Charlie's photo to pic of the month? Can't even get Lily's tablet to turn on now had it from china, so getting it replaced is turning into a bit of a ball ache. I'd do it myself Hollie but I can't do it either if some one can do it please let me no if you need a pic thanks mike..
Haha glow in the dark Charlie..
Email me the photo you want to add and I'll put it up for you. Thanks di.. His beak don't look real ha looks like its just been stuck on him..
he's won my heart that's for sure. are you finding ways of coping a bit easier now. Got them Mike, though some are super massive! I'll put a few up for you.